Although I am no longer a candidate for the 32nd Congressional District, my concerns remain. As I repeatedly said, we face great challenges. At some point, whether we like it or not, they will require confrontation and solutions. Reality is that which doesn't go away when you choose not to believe. We can choose to make those solutions for the benefit of the greater number, or for the few. For my part, I plan to continue to speak out. Although my views were labeled extreme, they simply reflect the basic values of opportunity, valuing both work and capital, protecting our civil liberties, paying for what we need, and taking care of those who cannot take care of themselves, in a return to the traditional American values of courage, tolerance, community, and forebearance, instead of fear, divisiveness, and coercion. I believe the true extremists are those who are actively working against those values, under cover of false righteousness and "smaller government." They seek to oppress, not liberate; to reduce broad-based opportunity for private gain; to enhance and use fear of other, of change, of loss, of the "enemy" of whatever flavor to reduce our liberty. I encourage you to engage in actively in working toward solutions that put us on the right path, a path of use of government to do the things we cannot do alone, and that produce public good. We have taken a wrong turn, along a path that is increasingly destructive. It is time to stop and set out for the right one. In 1996, when Pete Sessions was first elected to Congress, the federal debt was $6.2 trilliion. Today it stands in excess of $17 trillion as a result of decisions Sessions endorsed and voted for. We must get our fiscal house in order, matching spending to revenue, and Sessions and his colleagues have completely failed at this task. We must have sound policies designed to enable economic opportunities for all, educate all who have the ability and desire to learn, and create an America that provides ever-increasing opportunities for our children and ourselves. To zoom in to a street level view, follow this link. 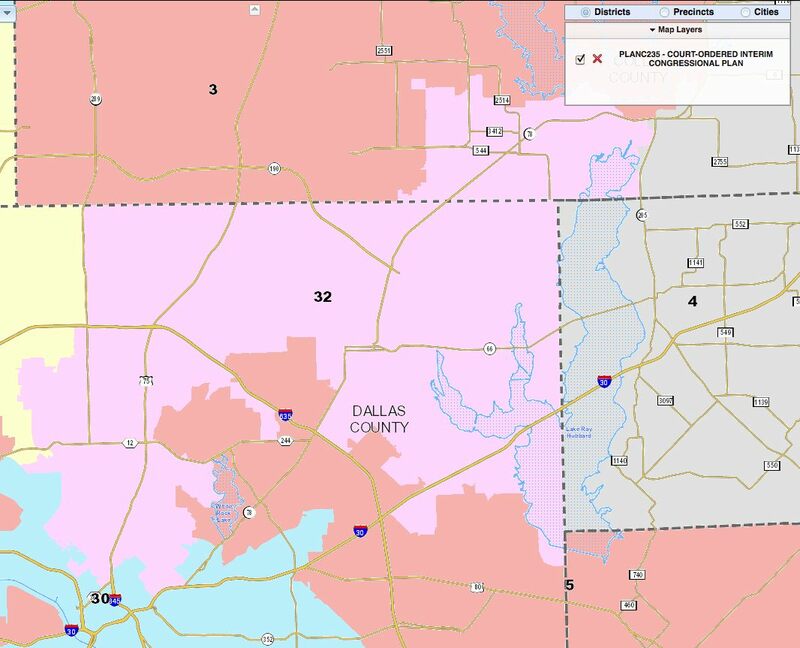 Select which congressional plan you wish to see, select district 32, and then zoom by clicking or with your mouse wheel.